This two week old has a high grade radial club hand with a normal opposite extremity. 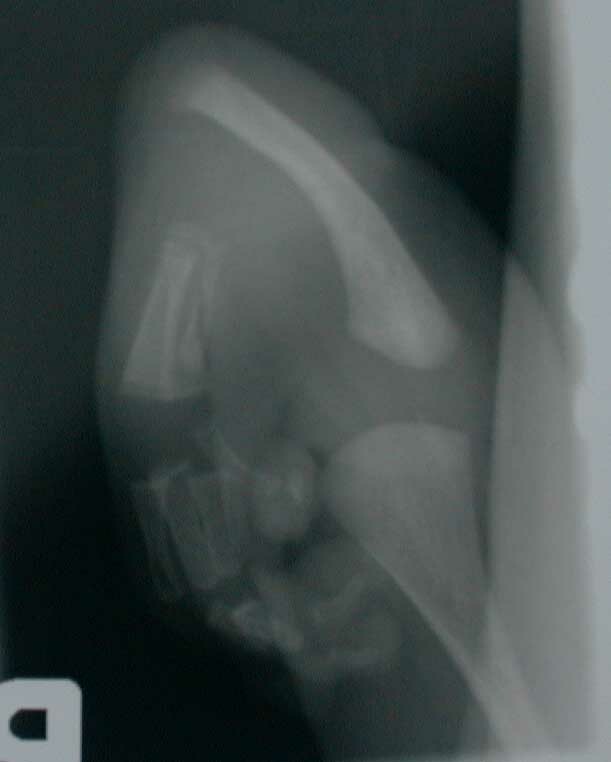 The presentation is unusual for a radial club, as the thumb is relatively normal, with syndactylyl and hypoplasia of the ulnar hand. Elbow passive flexion stretching exercises. Elbow flexion motion may be improved indirectly by splinting to improve wrist position. Angulation of the wrist may be helped considerably by splinting, although ulnocarpal displacement can only be corrected with surgery. Corrective splinting or casting should be undertaken immediately, which will reduce the extent of soft tissue release needed for correction. Splinting/casting for weeks to months. Prolonged splinting will restrict psychomotor development and for this reason the most common interval of splinting recommended before surgery is months but not years. Screening for associated medical conditions. Systemic and potential life threatening disorders are associated with radial club hand involving cardiac, renal, spine and hematopoetic systems and require screening before any surgery is undertaken. Early surgery is probably better. There is a trend to proceed with surgery at or before one year of age, but preoperative corrective splinting or casting is always indicated. Surgery before age one usually requires less soft tissue release, less frequent need for carpectomy, and is followed by more physiologic widening of the distal ulna to support the carpus. Results of surgery are clearly worse when delayed to the age of three or beyond. Elbow capsulotomy and triceps lengthening. Flap transfer of distal forearm skin from the area where it is most ulnarly redundant to the area which is most radially deficient. Buck Gramcko's wrist radialization with alignment of the distal ulna on the radial carpus and transfer of the entire radial muscle mass to the insertion of the extensor carpi ulnaris muscle, which is itself shortened by reefing. Profundus tendon transfers for wrist motor reconstruction would seem to be a good idea, but have been shown to be unreliable. Later procedures for syndactyly correction and pollicization.